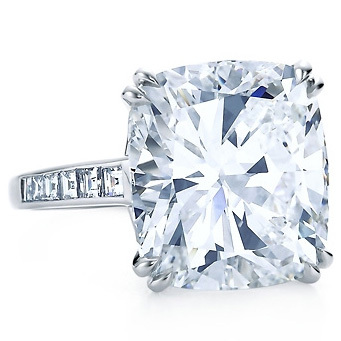 Shopping for Diamond Clarity, How Perfect Does it Have to Be? If He Were a Diamond, He’d be Flawless! Like Men, Few Diamonds are Perfect. Like men, most gemstones aren’t perfect. 99% of the all the diamonds you’ll ever lay your eyes on have flaws in them. Diamond clarity is really interesting to delve into, so come with your Santa Barbara Diamond Educator and check it out! Technically speaking, flaws are all the tiny crap and junk inside a stone. Flaws inside of a diamond are called “inclusions.” Flaws on the outside surface are called “blemishes.” A stone is “perfect” if it has none. Like men, perfect stones are few and far between. But really we don’t have the eyes of a hawk so imperfect can look perfect to us. Inclusions come in a myriad of different sizes, shapes, and colors. The most common are dark, black specks called carbon spots. Carbon spots come in all different shapes and sizes. Some diamonds have just a few; others have so many, they make the stone look almost black. In the past, they used to use black diamonds on saw blades. Now they mount them in jewelry and call them “chic!” But then so do I. I actually love black diamonds, but that’s another story for my blog! What do Inclusions Look Like? Some inclusions look like fuzzy areas. Some look like clouds. Some inclusions can be seen with the naked eye. 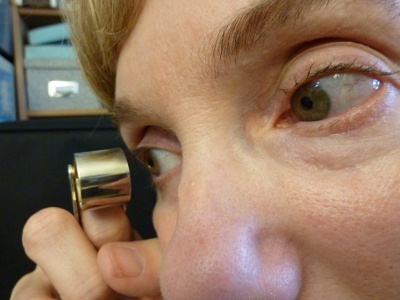 Most require the use of a loupe (a small jeweler’s magnifying glass). Which you should always use! If your jeweler doesn’t have one, you’re either in the donut shop next door…or something’s fishy. In either case: leave. Other factors being equal, the rule of thumb is the fewer inclusions in a diamond, the better it is. And of course, the more expensive it is, too. Are all inclusions bad? No. Like I said, almost every diamond you’ll look at contains them. As long as they don’t cloud up the overall appearance and detract from the light refraction, they should be OK. Light refraction is about how much light bounces back out of your diamond, versus how much went in. More is better! There’s nothing wrong with a small inclusion here or there. Besides, if every diamond was flawless, how would you tell your diamond from your sister’s? I like to think that inclusions add character and uniqueness to a diamond. Like men! Your Diamond Should Have a Fingerprint! Inside your diamond the inclusions are like a unique fingerprint. By knowing what your diamond’s inclusions look like, you’ll always have confidence that your diamond is your diamond when it comes back from a service visit. One of my client’s picked a diamond to buy from me with what we laughingly called the “Mickey Mouse” inclusion. their were three inclusions, two bigger circles above and a tiny one below, like Mickey Mouse. The inclusions were only noticeable under magnification, but were easy for her to remember. 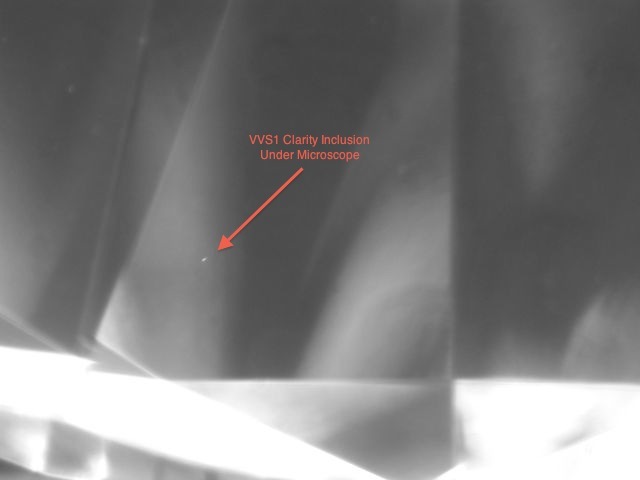 It’s very difficult to see the inclusions in a VVS diamond. It takes magnification and lots of practice. Stones of this nature are priced accordingly: high! VS diamonds are excellent stones, as well. Again, it takes magnification to see the inclusions. 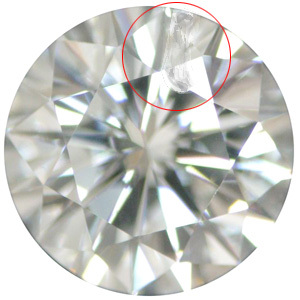 Inclusions in an SI diamond can easily be seen under a loupe. You’ll find lots of these gems on the market and factoring in good color and cut, can make excellent choices. I recommend SI diamonds all the time. Think of diamond clarity as a pyramid. At the top of the pyramid are the IF, internally flawless diamonds. At the bottom are the I clarity diamonds. So the fewer inclusions you demand, the scarcer your choices are and the more expensive the diamond. When These Inclusions Are Visible to the Eye That’s an “I” Clarity Grade Diamond and Not One That You Want! As you might have guessed, “I” clarity diamonds are less expensive. Their inclusions are bigger and more extensive and can be seen without magnification. Again, taking into account good color, cut, and carat weight, you can find nice stones, but in the “I” clarity grade, they’re harder to discover. If you can afford a VVS or a VS diamond, that’s great! If however you’re young and just starting out and your wallet’s feeling light, there are many good SI diamonds on the market. If your future diamond has been cut nicely, and has good color, an SI diamond can have lots of pizzazz and sparkle and be an affordable choice. 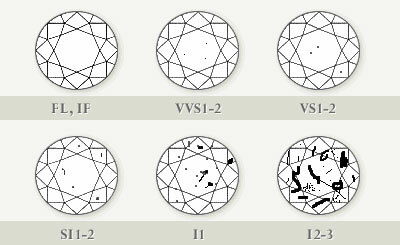 It’s actually not unheard of for an SI diamond to show better than a VS one due to its color and cut. Don’t shy away from them SI’s. I’ve seen lots of brilliant, fiery stones with an SI clarity. When you are choosing a larger diamond you’ll want to go with higher clarity grades. I’m speaking of 2 carats and above. 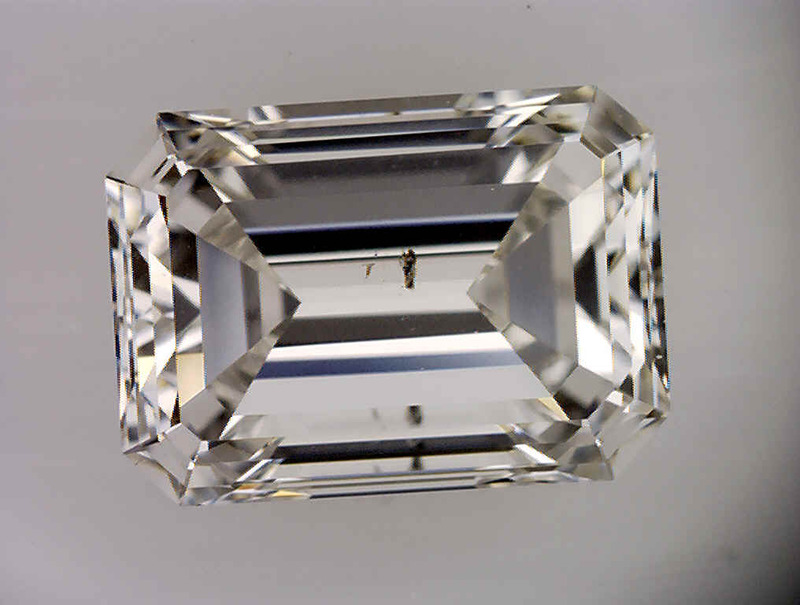 When you chose an emerald cut or Ascher cut diamond, higher clarity is more important. Emerald and Ascher cuts have longer lines and more open unfaceted areas to see into and less sparkly faceting underneath. 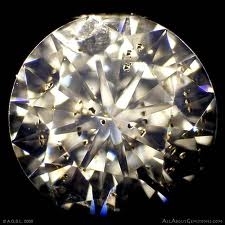 Therefore the diamond needs to be more perfect in clarity, because inclusions are more visible to the eye than with round brilliant cuts, princess cuts, etc. 1. Learn to use a loupe. 2. Print out a Clarity Grading Chart and Color Grading Chart. 3. Read the rest of this diamond shopping series to educate yourself. See links below. 4. Look at a few diamonds till you feel confident that you can see the differences in clarity and color. 5. When shopping in stores or online, know that a great clarity grade on a diamond certificate doesn’t guarantee a sparkly diamond. 6. Look at the diamond in person before you purchase it or have someone you trust look at it. Remember when you are choosing the right diamond for you, look for qualities you admire, like sparkle and personality rather than perfection, just like a man! 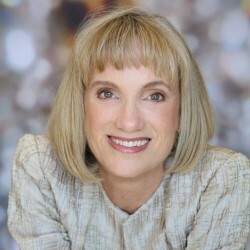 My thanks to Ira Weissman and his educational diamond and inclusion photos that I use here with his permission from his Diamond Clarity Chart. What to do With Divorce Diamonds? Great post and chock full of information for the conservative diamond buyer as well as one who has a bit more in their wallet. As a diamond educator and seller you offer crystal clear and direct buying know how. Thank you! Diamond clarity will be an important facet of my choice. Love this info! This will be invaluable. Thank you Calla Gold! 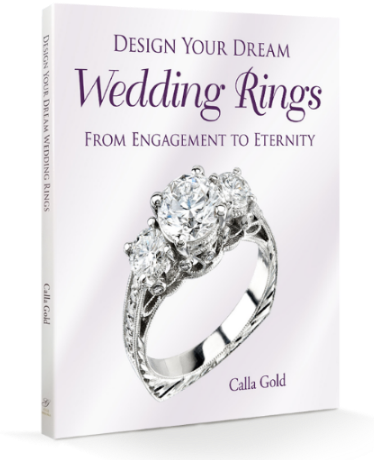 Hello Calla Gold Jeweler! Where were you 24 years ago when my husband and I were shopping for an engagement ring? Your article about the importance of diamond clarity is exactly what we could have used at that time! We chose a pretty tear-dropped shaped diamond, and I have been happy with it forever. (And my man). Wow I had no idea there was this much to know about diamonds. Reminds me when I used to think a sweet white wine was what I liked. Then I went on a wine tasting excursion and found out there was a whole world I knew nothing about. It’s amazing what we don’t know until we know it. Thanks so much Calla, for this incredible wealth of diamond information. I can’t wait until next time I go diamond shopping. Boy will that be a fun experience! What an incredibly useful guide you have provided us with Calla! Thank you for sharing you expertise on this diamond clarity! I have to say, I learned a ton of information here! Shopping for diamonds can be so frustrating, but approaching the task with some of the tools you’ve provided us with in the blog post makes the entire process so much less daunting. Knowledge is key! That’s a very useful article for diamond shoppers who usually place an over emphasis on clarity. Calla Gold, thanks for the cute guy picture and the great data on diamond clarity. It’s understandable and your diamond clarity chart is really good too!